Meanwhile, over in Hollywoodland … to no cineaste’s surprise, the silent film The Artist was named “Best Motion Picture of the Year” at the 83rd Academy Awards ceremony. While Tinseltown may have had a decent, if not mind-blowing, twelve months of production in 2011 – as evidenced by Woody Allen taking the “Best Original Screenplay” award for Midnight in Paris with his perhaps 24th- or 25th-best ever script – the year in basketball movies was disappointing to say the least. In hindsight, no real possibility existed for the 2011 crop of hoops flicks to match the previous year’s output in terms of either quantity or quality, what with ESPN in the midst of its “30 for 30” documentary series. Eight basketball documentaries (nine if you include June 17, 1994) mostly well worth watching – spearheaded by the most excellent Once Brothers – were released in ’10 alongside the barely-seen Saints of Mt. Christopher. Plus, BallinEurope got to crack jokes at Common’s expense while enjoying fave Queen Latifah thanks to the essentially NBA-sponsored Hollywood flick Just Wright – who remembers that one? And, of course, the artistic achievement of the 2009 tour de force, Who Shot Mamba? by former Yahoo Sports blogger/general comic genius at large has yet to be matched by any human endeavor, so one can’t fault the international film community for not approaching this one. Also in the much-anticipated but mostly unseen category is The Other Dream Team, a look at Arvydas Sabonis, Sarunas Marciulionis and Team Lithuania’s run in the 1992 Olympics. After its world debut at the 2012 Sundance Film Festival, this film will reportedly see international release this year in the runup to the London Games – and surely has to be considered the early odds-on favorite for the 2013 Oscar (Robertson) award. Filmmakers in Israel and Germany produced what could well be notable works in full-length dramatic presentation and full-length documentary, respectively, but BiE wouldn’t know due to the extreme limited release of these works. Playoff – which has yet to hit cinemas outside of Israel – is a fictional take on the incredible story of former Maccabi Tel Aviv player/coach Ralph Klein, a tale that incorporates political conundrums on a massive scale alongside top-level international basketball. After coaching West Germany in the 1984 Olympics and the 1985 European Championships as well as BSC Saturn Köln, Klein returned to Israel to coach his country’s national team and ended up taking one more Israel League title, a Cup win with Hapoel Tel Aviv in 1992. Over in Germany circa 2012, director Jens Pfeifer and Real Fiction Filme’s Phoenix in der Asche (No Ashes, No Phoenix in English-language release) is touring the country’s single-screen theatres with its European basketball-centered storyline after premiering at the Munich International Film Festival in June. And so, after considering what we (most of us, anyway) haven’t seen, one cinematic work remains in contention. While this film became the default choice for BiE’s honor, at least it’s a pretty damn good movie after all. 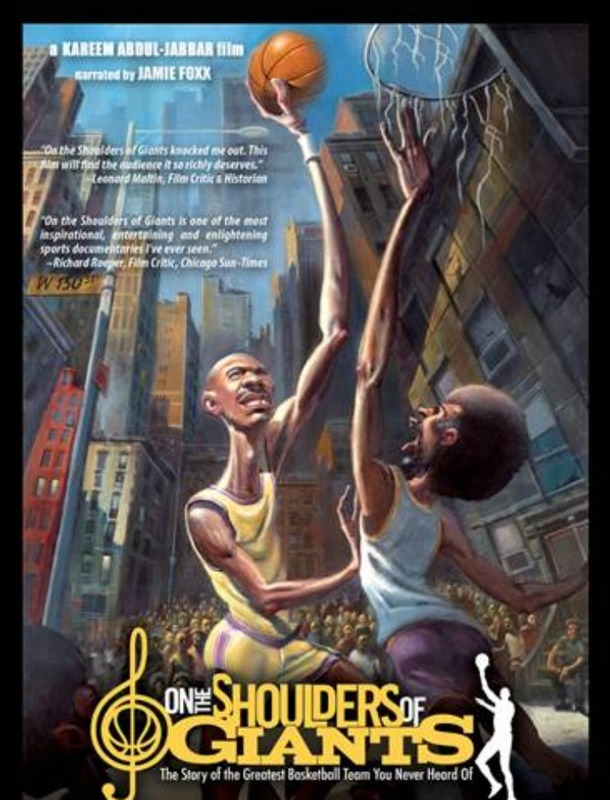 And so BallinEurope is proud to present the Oscar (Robertson) Award for Best Basketball Movie of 2011 to … On the Shoulders of Giants! It’s hard to believe BiE caught just one fresh release in 2011 – kind of a bizarro “if you must see one film this year” situation – but Shoulders of Giants helped make up for a lot of the forthcoming paucity of decent basketball films when first put out in February. You want high concept? Right, here it is: The tagline for the documentary reads, “The story of the best basketball team you never heard of,” namely the New York Renaissance, a.k.a. The Harlem Rens. Produced and written by Kareem Abdul-Jabbar, On the Shoulders of Giants is a celluloid goldmine for those who dig history, film technique and/or, of course, basketball. The film confronts issues of institutionalized racism – a subject always just under the surface in American ‘ball – head on while bringing together four generations of players, writers and famous fans of the game to discover this vastly overlooked team. Names you may or may not have heard of lending this talents to Abdul-Jabbar’s work include the main himself, Jerry West, Bill Russell, Charles Barkley, Carmelo Anthony, Julius Erving, Spike Lee, Jamie Foxx (providing narration), Wynton Marsalis, Samuel L. Jackson, Leo Carrasecca, Bill Tosheff, Bill Rhoden, Maya Angelou and, naturally, David “El Hefe” Stern. On the Shoulders of Giants received the (assumedly moral) support of the Naismith Memorial Basketball Hall of Fame, and with good reason. Kareem and Union Productions open things up with a debate inviting the audience to consider the all-time great teams: Russell’s dominant Boston Celtics, the Jordan-era Chicago Bulls, the Showtime Los Angeles Lakers, etc., before challenging those beliefs with the Rens’ tale. Formed in 1923 and playing until the birth of the emergent dominant force known as the NBA in 1949, the Rens ultimately compiled a 2588-539 (.828) record playing mostly in national tournaments and in barnstorming competition. Peak of all seasons came in 1932-33, when the all-black team went an insane 140-8, including an 8-6 record against the already-famous Boston Celtics. On the Shoulders of Giants documents the hard-to-follow trail of the team through the years, making up for the gaps in film clips with animation and recreation; along the way, even the hardest core of aficionados may discover for the first time unheralded greats such as Fats Jenkins, Wee Willie Smith, Hal Jackson and George Crowe. All in All, On the Shoulders of Giants is 90 minutes of basketball magic – and clearly the best hoops-centric film of 2011. We know that USSR and the fake “socialism” defeated!Do we need more antiSoviet (and of course..anti-social) propaganda? All these guys will tell us about debt crisis and the fake,too,”dream” of “Free Market” and capitalism? Is going to tell us Sabonys and Kurtinaitis about their present politics in Lithuania? @Boris: Hey, i agree that the 1992 Olympics actually put forth three “Dream Teams”. Croatia definitely deserves recognition for its greatness in that tournament, and BiE’s viewpoint is that the ultimately movie trilogy in preparation for the 20th anniversary notices would be “The Other Dream Team,” “Once Brothers” and pick-your-Team-USA documentary. All respect to Team Croatia, 1992!